Since the beginning of time pieces of rock and metal have been falling to Earth. Some of these meteorites land where the climate permits them to survive for thousands of years. Since they fall randomly and continuously to the surface of our world there are thousands out there to recover. 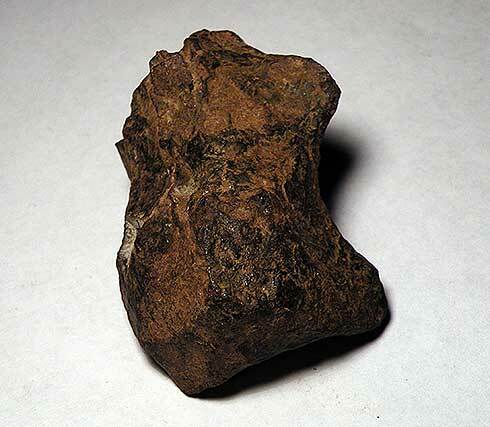 All these meteorites that fell in the past with no one to seeing are called Meteorite Finds when they are recovered. Because they represent the accumulation of thousands of years they vastly out number the meteorites that are witnessed and referred to as Meteorite Falls. Pictured above is a 434 gram stone with nice remaining fusion crust and thumb-printing. It is still quite black though it is smoothed off some with no fine details remaining on the surface other than tiny bumps. The circumstances surrounding the recovery of these old meteorites are widely varied. Some examples include farmers plowing them up, hikers stumbling on them while out in the wild, professional meteorite hunters working a piece of desert with little more than hope that they will be lucky, scientists working ice fields and moraines in Antarctic and hobbyist going where ancient meteorites have been found before are some of the ways. What all these methods have in common is that the meteorites found are ones that were not seen coming into the atmosphere. No one heard the explosion of the mass as it disintegrated under the stresses of the plunge to Earth. No one was there to see the bright streak of light and the blinding flash as it fell apart into the hundred or thousands of pieces that are hunted for today. Some of these ancient meteorites have laid where they are found for 20,000 years or even more. Many have not moved more than a tiny bit since landing. Others have been washed away from where they landed or moved by glaciers to locations far from where they originally came to rest. Some are now very deeply buried while others remain on or have been eroded back to near the surface. A host of things can and does happen to meteorites over thousands of years. Gold Basin meteorites have laid on the desert surface for more than 25,000 years and many have never moved at all. They have survived the ravishes of ice ages and yet some still have fusion crust. The specimen pictured above has an interesting inclusion of several different minerals and metal zones. Sometimes a single stone will be found and spur the hunters to go and look for more. After what can be a long time another piece may be found. With more hunting even more pieces of meteorite may be discovered. Gradually the pattern of the original fall zone or strewnfield as it is called will emerge. Continued hunting may result in the finding of thousands of pieces from an event that occurred hundreds or thousands of years ago. Such was the case at both Gold Basin and Franconia in the western part of Arizona. However, as I said a moment ago meteorites fall randomly and continuously. So during the hunting at a location for one meteorite others that fell at different times in the past may also be recovered. At both of the locations just mentioned several different meteorite events have been identified. Hunting just any patch of desert terrain is difficult and often unrewarding. In all likelihood there is a meteorite to be found in every square mile of the Earth’s surface but when you are standing in the square mile looking around you see what a daunting task hunting carefully a square mile is. That is why the finding if that first piece is often an accident. There are other places though where it is possible to do much faster and more efficient hunting. Areas where there are few rocks and little vegetation allows the meteorite hunter to see farther and test far fewer suspect rocks. This is the reasoning behind why so many hunters work on dry lake beds. The flat clay surface free of bushes and trees makes hunting faster and easier. Many meteorites have been found on dry lake beds. 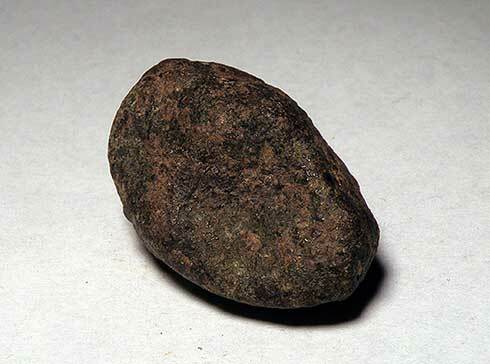 This is a 12.2 grams small meteorite find that is gradually being covered with a coating of reddish brown weathering. But you can still see the black fusion crust beneath. Unlike meteorites recovered after witnessed fireball events, Meteorite Finds are usually not as fresh and can in fact be very old and weathered. That is not to say that occasionally a meteorite that arrived only a few hundred years ago is not found looking nice and black and fresh. Fresh meteorites are found. But, because Finds represent the accumulation of thousands of years it is more likely that they will show the effects of being in the weather for a long time. Finds are often cracked and broken. Repeated cycles of freezing and thawing open an initial crack and will gradually split a meteorite apart. Eventually meteorites become nearly unrecognizable as they breakdown and their minerals decompose. 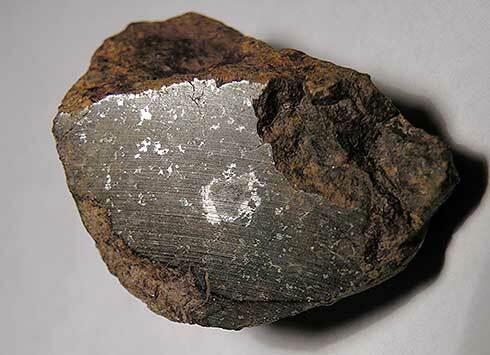 Pictured here is a 157 gram meteorite that has begun to crack apart. Water entering the crack freezes and like a soda bottle left in the freezer expands and breaks the material surrounding it. 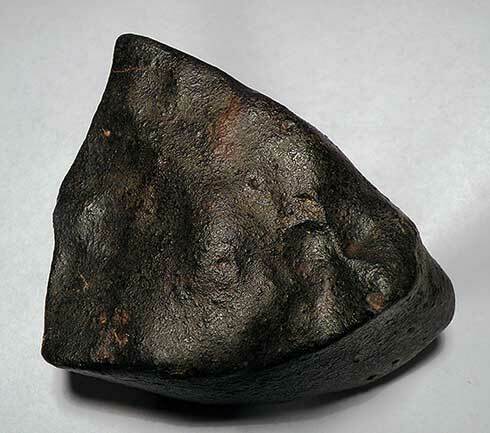 This meteorites has probably been on Earth for thousands of years. Note how the cracks fill with clay and gravel. The fusion crust of melted rock protects many meteorites until an initial crack or broken spot occurs and the inside is exposed. 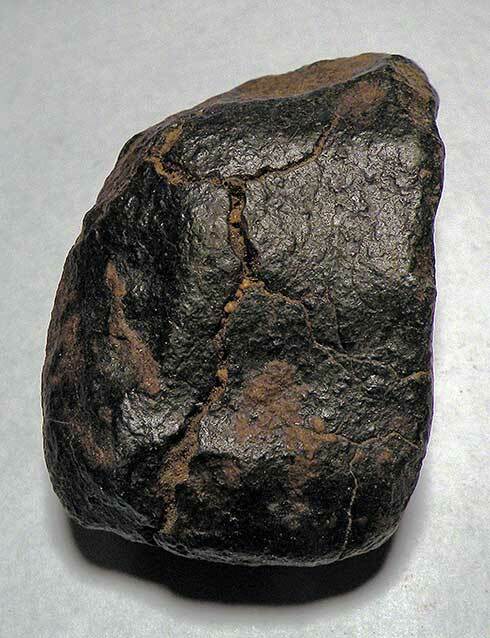 Meteorites contain iron and as we all know if you leave iron out in the rain it will rust. Meteorites are no different from a shovel or pair of pliers that are left out, they turn from black to brown on the outside. They are stained with a brown color on the insides too. The metal grains they contain can swell as they rust also causing the rock to crack and break down. The fusion crust that Finds have can be fresh or completely blasted off by the wind. Again location and exposure make all the difference. If the meteorite was quickly covered by mud or dust or sand it may have its fusion crust protected for thousands of years. Later if it is found soon after it is re-exposed above the ground surface that fusion crust can still be nice and show details of the flight through the atmosphere. 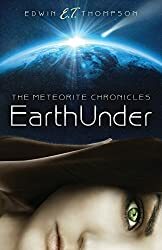 But, on the other hand if the meteorite lay on the surface for thousands of years in a sandy area with high winds the thin fusion crust layer can be removed in a geologically short time. This meteorite will have a smooth brown surface and be harder to recognize. Recently, a large area has been discovered containing iron meteorite fragments. They are called Agoudal meteorites and usually have a rather thick coating of weathering on them. This coating has developed over a long time and actually provides some protection for the metal beneath once established. The specimen showed here weighing 90.3 grams has been only lightly cleaned to remove dirt and clay and the loose mineral material. Another type of Find is a meteorite associated with an impact crater. Fortunately, there has not been an asteroid impact which excavated a huge crater during recent history. But, there are many craters on the Earth and some have meteorite fragments in the ground surrounding them. Meteor Crater in Central Arizona is a fine example of an impact crater with meteorite fragments buried out miles around it. Hunting for meteorites is no longer permitted at Meteor Crater, but during the hundred thirty years since it was recognized as an asteroid impact site many thousands of fragments were found in the area. These chunks of iron are all Finds since no one was there 49,000 years ago to see the event. Other craters around the world also have meteorites buried around them. The Henbury cluster of more than a dozen craters in Australia was also formed by a group of iron asteroids or chunks of one which broke up before impact. Thousands of meteorites have been recovered around the Henbury craters too. Iron meteorites account for only a small percentage of all Meteorite Finds. With just a few exceptions iron meteorites are the type associated to craters. It seems reasonable because of the strength of the iron that large masses would survive intake to the ground better than brittle and flawed asteroids of stone. So whether it is an iron from a crater or a single iron found in a dry river bed or thousands of stone meteorites recovered in a portion of the desert. If they were not found after a witnessed fireball or after hearing mysterious detonations then the meteorites are Finds. 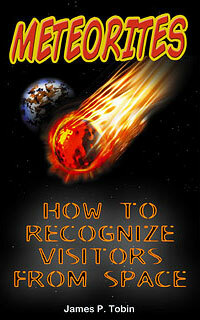 « Meteorite Falls – Why Are Some Meteorites A Fall?